WOMBOOTA farmer Alastair Starritt has spent more than a decade transforming the family’s livestock and cropping property’s soils. Located about 40km northwest of Moama, Alastair is an advocate of minimum till soil management, and recent seasons have seen him employ a Primary Sales precision seeder for the critical cropping task. Working with his father, Ian, and younger brother, Malcolm, who manages the livestock side of the business, Alastair is cropping about 2500ha each season as well as share-farming and contracting. ‘‘We’ve been biologically focused for about 10 or 12 years and soil health is our No.1 priority and prior to that we went to zero till. ‘‘We’ve gone away from synthetic fertiliser and do a lot of nutrition foliar spraying during the season,’’ he said. The system has allowed the Starritts to scale back and ramp up as the season unfolds without having to outlay everything upfront on inputs. ‘‘All in all, it has probably kept us in the game, but no two years have been the same and you are still guessing what is going to happen,’’ he said. There has been noticeable soil health improvement. ‘‘We’ve got worms and frogs and lizards and all the tell-tale signs that the system is working, and we seem to be able to get crop out reasonably well,’’ he said. Attending ag college at Roseworthy opened Alastair’s eyes to zero till’s merits. The catalyst was to trim costs. ‘‘We started with a home-modified Connor Shea air seeder and then went to a Bourgault tined machine with inter-row discs and we thought we were going ahead in leaps and bounds,’’ Alastair said. ‘‘Being spring tine, though, it was working harder than it needed to and it started to give trouble even though the principle was good. Then Primary asked if we’d seen their bar and we’ve now put in three crops with it. The farm runs from heavy river clays to sandy loams — a huge variation in soil type, according to Alastair. it up, gave it grease and it was out working the same day. ‘‘I don’t doubt there’ll be normal wear and tear, but we’ve had three years of doing nothing but filling it with seed. livestock, so we’ve got to get that balance,’’ Alastair said. The Primary is linked to a Bourgault variable-rate, easy-to-clean cart — a feature that makes it handy for the contracting business. that’s great for water harvesting. ‘‘We sow over irrigation banks and it comes up like a carpet,’’ he said. The press wheel profile gives good seed contact. The straight, near-vertical tine combined with the open 5/6 rank frame with high underframe clearance (800mm) ensures excellent residue handling capacity. The assemblies can be pinned up for skip-row spacing. Row spacings of 260 or 300mm are standard, though other spacings are available. Tine-circuit pressure is cabin-controlled across the machine, which is generally set at the start of the season and not touched. Primary Sales’ George Dartnell said the WA brand was making inroads into the eastern states. ‘‘We’ve got a dealer network established, but it is word-of-mouth that works for us. 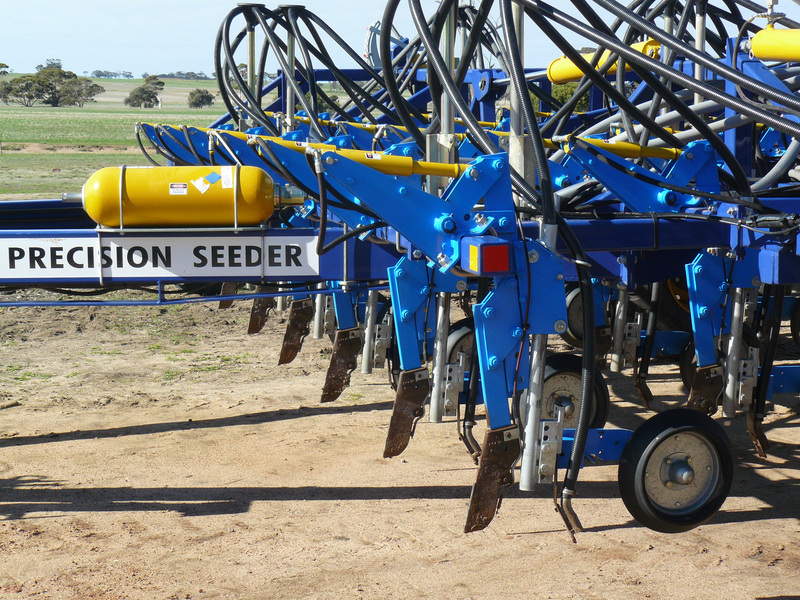 ‘‘The seeder can also be fitted with a disc seeding module, which fits to the back two ranks of the bar for reopening and accurate seed placement while the Primary is available in a 5.5m centre frame out to 18m widths. Alistair said they sowed into heavygoing, 4.5-tonne wheat stubbles, with minimal issue this season. ‘‘We try to chop everything as low as we can and there was only a half a day when it was too wet to go through. ‘‘We’ve all been so critical in getting a crop in and established with regard to rotations, variety and chemical groups, and it has been moisture that has been the factor. ‘‘Everyone is looking for that chalice — something to solve the issues — but I think it is a matter of combinations and everything being lined up. ‘‘I would expect there are 15 or 20 seasons in this thing,’’ Alastair said.